The following pricing is valid for carry out items only. Choice of 3 DIFFERENT Items, Served with a choice of 2 sides: cornbread, baked beans, french fries, coleslaw, or applesauce. Or substitute the following for an extra charge: corn on the cob (add $1.00), onion rings (add $2.95), sweet potato wedges (add $2.95). Served with Red Potatoes and Corn on the Cob. Two Jumbo Snow Crab Leg Clusters, Six Steamed Oysters, Six Steamed Clams, 1 lb Sautéed Mussels, and Six Spiced Shrimp. Served with Red Potatoes and Corn on the Cob. 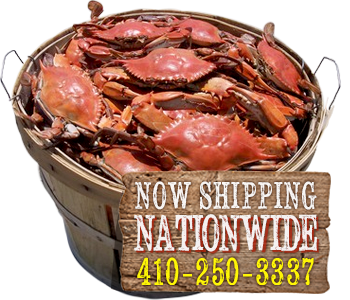 Four Jumbo Crab Legs, Four Steamed Crabs, Twelve Steamed Clams, 1/2 lb Spiced Shrimp, 1 lb Mussels, Two Corn on Cob "In Season", and Two Fresh Salads. Served with choice of two sides: Corn Bread, Baked Beans, French Fries, Coleslaw, Apple Sauce. For an additional fee, substitute Onion Rings, Corn on the Cob or Sweet Potato Wedges. Choice Of 1 Meat (5 oz) Or 2 Meats (10 oz) Served On A Fresh Roll with Our Kettle Chips. For an additional fee, substitute French Fries, Onion Rings or Sweet Potato Wedges. Served with Our Kettle Chips or substitute Fries, Onion Rings or Sweet Potato Wedges for an additional fee. "Hand-Picked Crab Meat Never Frozen"
"Pit Beef topped with Crab Imperial"
1 pint served with cornbread. 100% Real Cheese Bake to Order OOH So Good!!! Fresh Po Boy loaded with seafood served on a 10" Roll with L&T. Served with Our Kettle Chips or substitute French Fries, Onion Rings or Sweet Potato Wedges for an additional fee. Served with Our Kettle Chips or substitute Fries, Onion Rings, or Sweet Potato Wedges for an additional fee. Additional Charges for extra toppings and sauces. Fresh Never-Frozen Crab Cake Carry Out Special!!! Cooler and Refrigerant Available for an additional fee. *Menu items AND prices subject to change without notice and subject to availability. **Health Department Warning: Consuming Raw or Under-Cooked Meat, Poultry, Seafood, Shellfish or Eggs may increase your risk of food-borne illness, if you have certain medical conditions. ***Our Kitchen HAS Peanut and Gluten Products.